50 FREE PRINTABLE GARLANDS AND DIY BANNERS YOU NEED FOR YOUR WEDDING OR PARTY DECOR! 2. This Paper Leaf Garland is all kinds of pretty via The House That Lars Built! Imagine tons of those draping beautifully! 3. Calling all the cat lovers! Learn how to make this cute Kitty Cat Garland via A Subtle Revelry! 4. 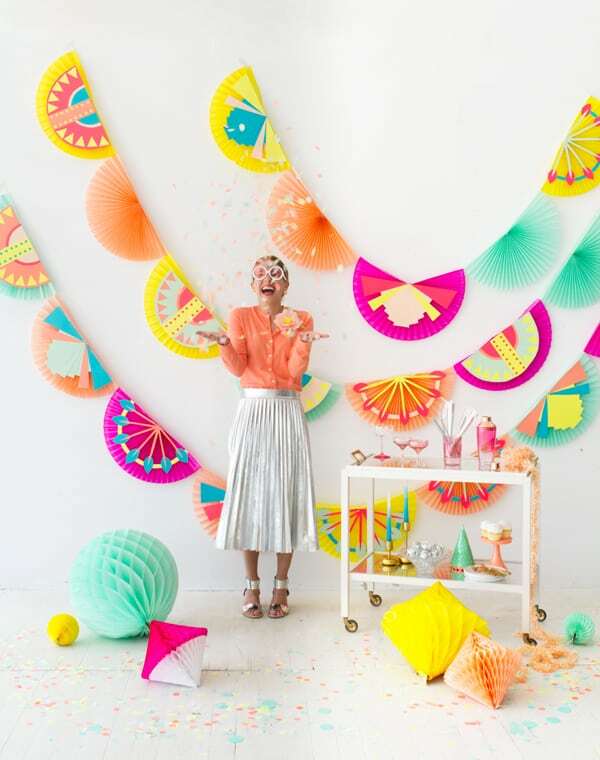 Go rainbow balloon crazy with this insanely amazing Zig Zag Garland via Oh Happy Day! 5. This Pouty Lip Garland also via A Subtle Revelry is perfect for Valentines Day! 7. Carry the holographic trend over to 2017 with this Sparkly Garland DIY via Paper and Stitch! 9. Pom poms are the bomb and I absolutely adore this Pom Pom Garland via Julep! 10. Sometimes you just can’t beat the Classic Tassel Garland! Learn how to make one via Studio DIY. 11. How cute is this Ice Cream Garland via Oh Happy Day?! 12. This awesome Art Deco Fan Garland is also via Oh Happy Day! So fun! 13. We created this Cute and Colourful Alphabet Banner for you to print for free! 14. We love how bright this Hanging Vine Garland is too via A Subtle Revelry. 15. This Paper Dots Garland made of crepe paper is super easy to make! Via Oh Happy Day. 16. You can get kids involved with helping make this Watercolour Garland or grab your bridesmaids for a painting party! The style is so effective! Via Art Bar Blog. 17. This Metal leaf Garland would be perfect for an Autumnal wedding! Via Sarah Hearts. 18. Grab our Free Printable Christmas Cactus Garland to jazz up the festivities! 20. I love the geometric look of this Interlocking Garland via Oh Happy Day! 22. Who says garlands have to hang on walls when they look this pretty on chairs?! Make this Dipped Crepe Paper Via Love My Dress. 23. This Candy Letter Garland is literally….super sweet! Plus it’s a free printable, you can grab it via Oh Happy Day! 24. This Giant Paper Bead Garland reminds me of those necklaces we all used to make when we were kids! via Oh Happy Day. 25. I love how fun this Linking Balloons Party Garland looks! Again via Oh Happy Day. 26. This easy Fringed Tissue Paper Banner adds a modern twist to the classic bunting! Via Delineate Your Dwelling. 27. Turn toilet paper rolls in an awesome Candy Garland via The House That Lars Built! 28. Brighten up the walls with this DIY Feather Garland featured on Bespoke Bride last year! 29. Have a popsicle party with this Jumbo Popsicle Garland via Oh Happy Day! 30. Sometimes, you just can’t beat those big beautiful Honeycombs Garlands! Again via Oh Happy Day! 31. Or really get into the party spirit with this Party Hat Garland via The House That Lars Built. 32. Earlier on the year we created this Cascading Flower Garland Backdrop and it’s still one of our favourites to date! 33. Bring summer back into your life with this DIY Cocktail Umbrella Garland via Lonny! 34. This Free Printable Fruit Garland will also brighten things up via Minieco! 35. If you love honeycomb garlands then why not try this Honeycomb Balloon Garland via Studio DIY? 36. Or a Colour Blocked Walnut Garland also via Studio DIY! 37. Turn paper napkins into something extra pretty with this Paper Napkin Garland DIY via Oh Happy Day! 39. Say cheers with this Sequin Letter Garland DIY via A Beautiful Mess! 40. This beautiful Macrame Yarn Garland is also via A Beautiful Mess. 41. Here’s a garland with another pop of colour, make these Paper Ball Chains via Made Everyday. 42. I love adorable this Striped Lantern Garland is via Oh Joy! 43. Another fun honeycomb DIY for you here with this Honeycomb Easter Egg Garland via Oh Happy Day! 44. It’s no secret that we love geometric shapes at Bespoke Bride so this Brass Geometric Garland via Lovely Indeed is right up our street! 45. We also loves brightly coloured sweets so how fun is this Bubblegum Garland via A Subtle Revelry?! 46. We love this Wooden Gemstone Garland via Tell Love and Party! 47. Paper Flower Garland’s are up there with the prettiest of garlands! Especially this one via The House That Lars Built. 48. I love this fun Pun Lip Garland via Studio DIY! 49. Keep the rainbow vibes alive with this Rainbow Geometric Garland via Oh Happy Day! 50. This super easy Printable Chain Banner looks super effective once all strung together! Via Alice & Lois.